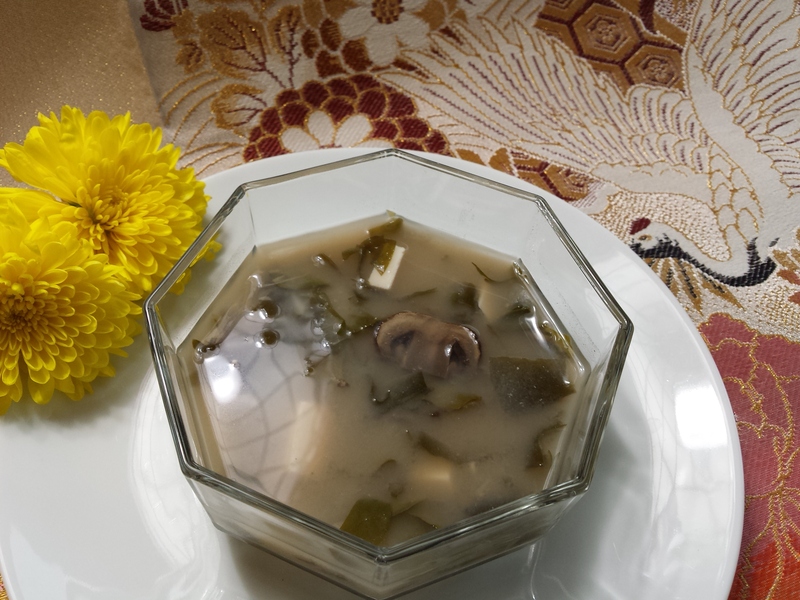 Hearty miso with mushrooms! Miso is neither difficult to make nor very time-consuming. Cremini mushrooms are fat-free, cholesterol-free, gluten-free, low in sodium, and full of vitamins and minerals. Miso is made of fermented tofu and rice or other grains. There are many types and colors of miso, but white miso is the most mildly flavored. Wakame seaweed is packed with vitamins and minerals, as well! So what we have is a flavorful, healthy, hearty soup for the upcoming fall season! Bring liquids to a boil, reduce to simmer. Soak wakame in water for 5 minutes; drain and chop. Add wakame, onions, greens, and mushrooms to liquid. Simmer 10 minutes, stirring occasionally. Reduce heat. 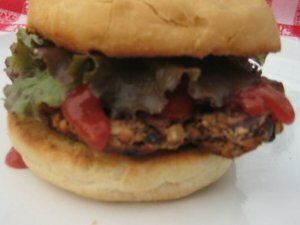 Add tofu. In a small bowl, whisk a couple tablespoons of hot water into miso until smooth. Add to cookpot, stirring gently. Add only ¼ to ½ teaspoon sea salt, to taste. Remember, the seaweed is very salty. Serve immediately with crispy rice crackers. Beautiful fragrant golden soup with tofu – yum! Red bell pepper and cilantro make a colorful addition – sort of like fireworks – and the curry can be like fireworks in your mouth! If you like it milder, just use mild curry powder or less of the hot stuff. Speaking of hot stuff, we’re going to help you impress your dinner guests with kitchen trivia. Did you know that “oz,” the abbreviation for ounce, comes from onza, the Italian word for ounce? Sauté onion and red pepper in olive oil for about 3 minutes. Add spices and sauté 30 seconds more. Add vegetable broth, coconut milk, and soy milk. Reduce heat and simmer 12-15 minutes. Add cubed tofu pieces, stir gently, and simmer another 3 minutes. Serve over cooked rice; garnish with cilantro. Makes 4-6 servings. 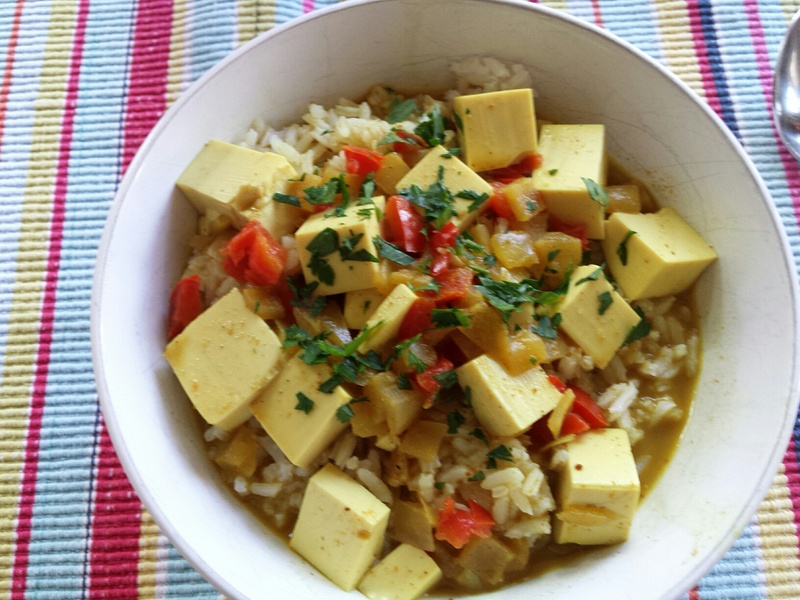 Chef Robert Church, author of The Tao of Tofu, was kind enough to share this recipe with us. Lime and chilies give a tart and spicy hue to this variation of the Thai classic. The vegetables provide additional flavor and color. 1. 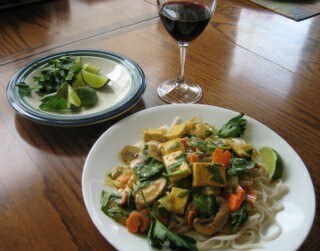 In a medium-size sautè pan or wok, fry tofu in the vegetable oil until lightly browned. Drain on paper towels. 2. Heat the vegetable oil to medium-high, add the carrot and bell pepper, and sautè 1 minute. Add the garlic, and carefully sautè 1 minute more. Don’t burn the garlic. Add the tofu and continue to cook. 3. Whisk together the chili, tamari, lime juice, ginger, and sugar. Pour into the pan and toss with the vegetables and tofu. Cook until the sauce thickens and coats all the ingredients.